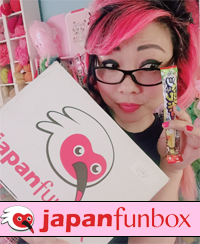 Recently, Michaels.com added online shopping to their site, which is pretty cool! But it looks like a lot of their knit and crochet patterns disappeared. I have no idea what the future of those patterns is, but you guys have been asking me to post some of the projects you are in the middle of! 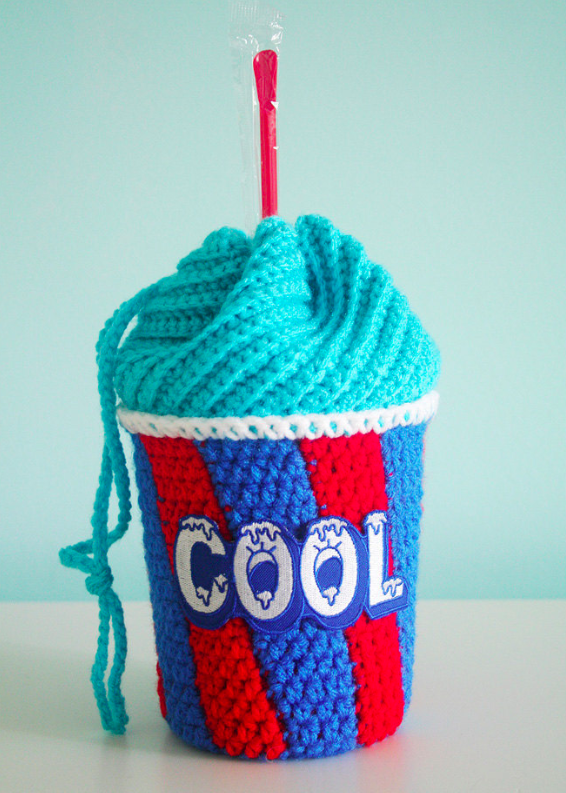 So here is the Slushee Cup Drawstring Bag pattern. I also now sell the finished item in my Etsy shop for those who don’t crochet. 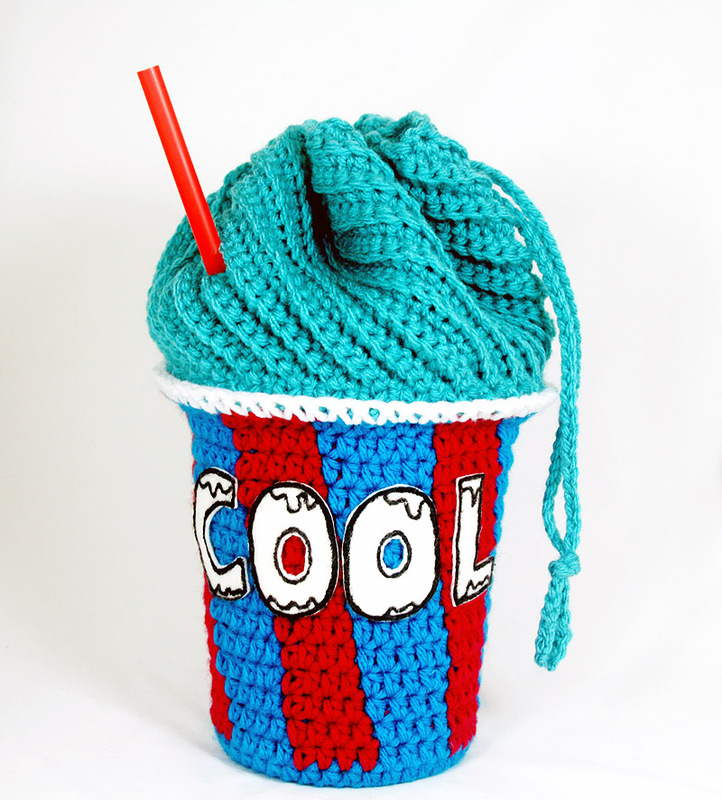 Stay cool poolside with this crocheted Slushee Drawstring Bag! It’s just big enough for you to throw in your phone, keys, sunnies, lip balm, and a little cash, so you can keep a light load while catching some rays. 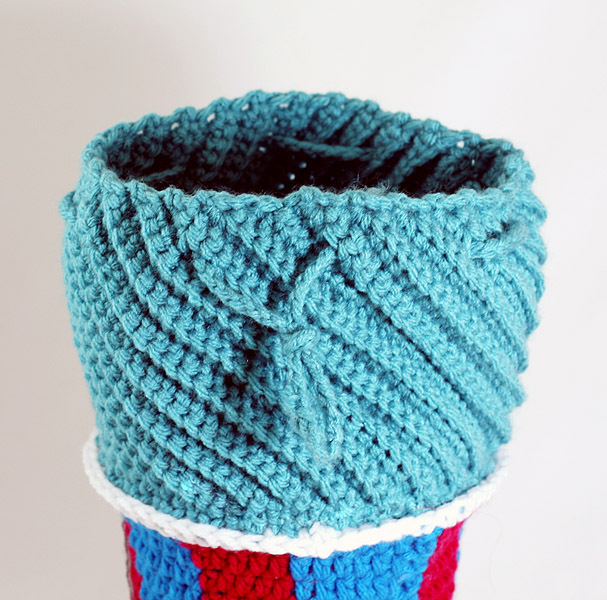 I reused a takeout soup container to reinforce the inside of my project, but you can still use your Slushee without. You can customize your cup by choosing the word or phrase that you like best with felt cut-outs and fabric paint (I used a custom patch that I designed!). You can even add a real red straw accent! felt, Fabri-Tac fabric glue, and fabric paint or embroidery thread to create the words “COOL,” or you can purchase my patch! 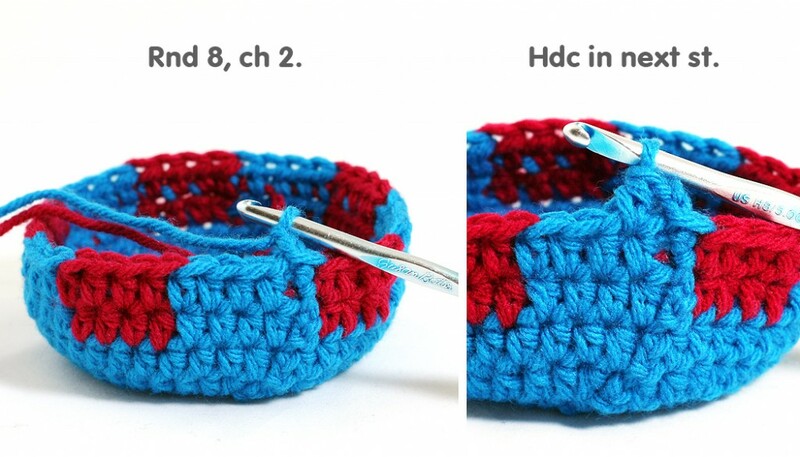 Sc2tog : “single crochet 2 together.” Insert hook into next st, YO, pull through 1 loop. Insert hook into next st, YO, pull through 1 loop. YO and pull through all 3 loops. – When changing to a new color of yarn, work the last stitch in the old color until the last pull-through, then pull through with the new color. – If your yarns become too twisted while alternating two colors, pull your hook out of the project and spin the project around to untwist the yarns. Re-insert your hook and continue. -You’ll be starting with the bottom of the cup. -With Popsicle Blue, make magic ring, or ch 3 and sl st to 1st ch to form ring. -At the end of each rnd, sl st to 1st st of rnd to join. – Now you will begin to create the stripes of your cup. – Ch 2 does not count as 1st stitch. – When you drop the color you are not working with, you should carry it along. Rnd 18-19: Ch 2, 6 hdc. Drop Popsicle Blue, join Cherry. 5 hdc. [Drop Cherry, pick up Popsicle Blue. 6 hdc. Drop Popsicle Blue, pick up Cherry. 5 hdc] 4 times. With Popsicle Blue sl st to 1st hdc to join. (55) Break off Popsicle Blue and Cherry. Weave in ends. – With Aqua, ch 25. – This piece will first look like a parallelogram or a rectangle with angled sides. When instructed, working in the back loops only (BLO) creates the ridges and texture. – Throughout this piece, you will create 10 holes towards one end, alternating every 5th or 6th row. You’ll use these holes later to weave a drawstring through your purse. With Aqua, ch until your drawstring is approximately 22 inches long. Break off and weave in ends. 4. 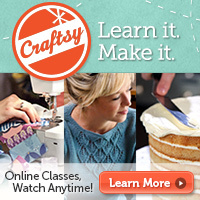 Outline each letter with black embroidery thread or black fabric paint. Add “frozen drip” details, if you wish. 5. If you have a plastic cup for the inside, insert it now before gluing the letters on to accommodate any stretching. Attach letters with Fabri-Tac™ and allow time to dry. 6. 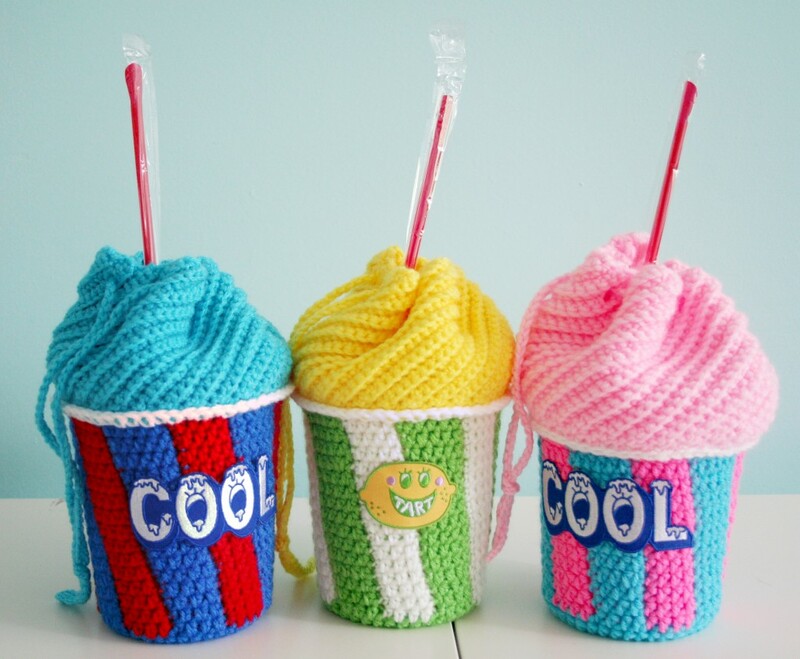 If you want to stick a straw into the Blue Slushee, pinch one end of the straw to fit it through your stitches. You’ll be cutting this off, so it’s ok if it looks ugly! I left about 3 inches of straw on the outside of my bag and trimmed the end on the inside of the bag to about ¼ inch. 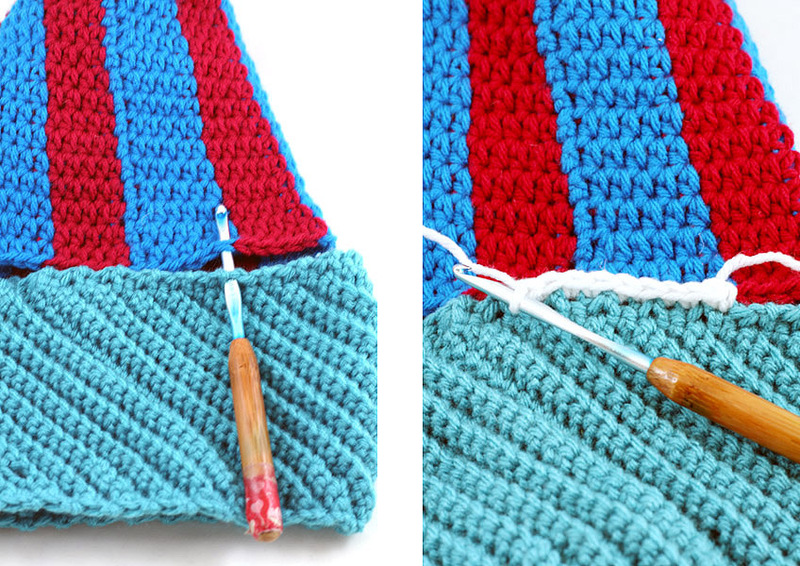 I then applied a line of glue around the bits where the outside of the straw touched the crochet fabric. Hi, yes, that’s fine. If you can credit me as the designer on hangtags or signage or online listings, that would be really appreciated.